Russian Jewish Hebraist; born at Ujasin, government of Wilna, 1850. He emigrated to England in the nineties and settled at Manchester, where he opened a printing and publishing office. 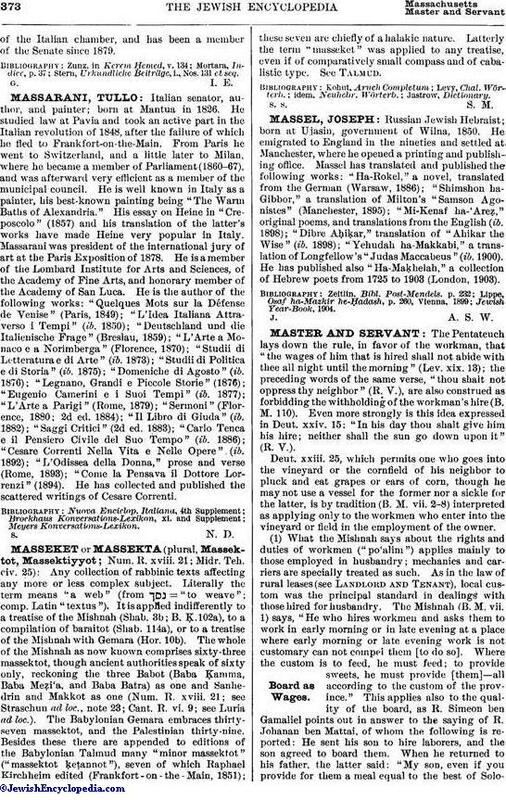 Massel has translated and published the following works: "Ha-Rokel," a novel, translated from the German (Warsaw, 1886); "Shimshon ha-Gibbor," a translation of Milton's "Samson Agonistes" (Manchester, 1895); "Mi-Kenaf ha-'Areẓ," original poems, and translations from the English (ib. 1898); "Dibre Aḥiḳar," translation of "Ahikar the Wise " (ib. 1898); "Yehudah ha-Makkabi," a translation of Longfellow's "Judas Maccabeus" (ib. 1900). He has published also "Ha-Maḳhelah," a collection of Hebrew poets from 1725 to 1903 (London, 1903).